I really liked AVP1. I found it pretty entertaining and a lot better than some people say. AVP2 starts off where AVP1 ended. The Predalien attacks and kills the Predators in their spaceship and the ship crashlands near the small town Gunnison in America. A Predator picks up the crash on his monitor and hurries to Earth to eliminate the Aliens and any human witnesses. 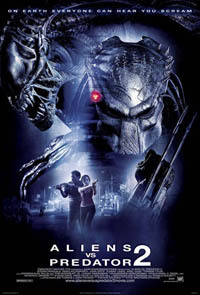 The movie is pretty entertaining and there is a lot of fights between the Predator and the Aliens. Unfortunately almost all scenes take place in the dark with lots of rain and you can barely see a thing. It is however nice to see a movie that doesn't hesitate killing pregnant women, children and other weak elements. Something you rarely see in an action movie. The actors are not exactly world class but that doesn't matter much since most of them are wiped out by Aliens or the Predator or both. The movie would have been a lot better if you had been able to fully see the monsters and the fights. It is not totally bad and certainly better than the awful Predator 2 movie. Compared to the rest of the Alien or Predator movies it doesn't stand a chance.